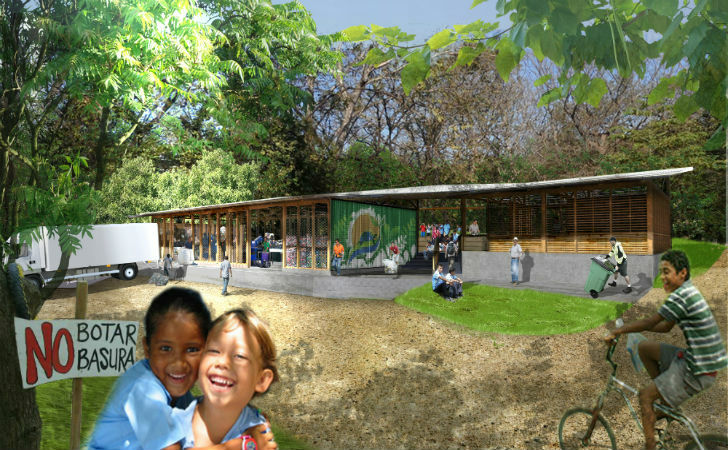 Some of the talented architecture students at the New York Institute of Technology (NYIT) have been working overtime this past year by volunteering to design a recycling center for the community of Nosara in Costa Rica. The service project is aimed to help alleviate a failing waste management problem in the area. Students of the sLAB (student led architecture build) initiative hosted a design competition and have selected their winning design, which will be built this summer. The project is now seeking support through a Kickstarter campaign to ensure the success of the student design-build project. Although Costa Rica is known for its efforts in sustainability, there is a mounting problem related to waste management. Poor infrastructure and a lack of education and policies is leading to overflowing dumps and trash in critical habitats and waterways. Over sixty percent of the 2,400 tons of waste produced daily are put into open, unregulated dumps and less than ten percent actually gets recycled. Architecture students from NYIT’s sLAB initiative, led by their teacher Tobias Holler of Holler Architecture, are working on a project that can help the waste management problem for the community of Nosara on the northwestern coast of Costa Rica. 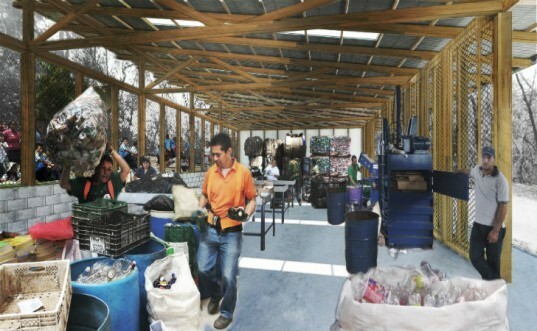 Their plan is to build a community-run recycling and education center. The building itself takes inspiration from local passive tropical design strategies and is a long, narrow, open-air volume to encourage natural ventilation. The center has three zones (a sorting facility, an open lobby, and support spaces) under a common roof and will be made from locally sourced timbers and recycled materials. High ceilings and a reflective roofing materials will minimize heat build-up inside. Members of the local community support the project and the city has already donated the land for the building while a local architecture firm, Salagnac Architectos, is aiding the students’ efforts. sLAB recently began a Kickstarter campaign to fund the project, help pay for the students travel to Costa Rica and document the project during construction. If you can, please donate to support the students and their project to help the local community. Although Costa Rica is known for its efforts towards sustainability, there is a mounting problem of waste management. Poor infrastructure and a lack of education and policies is leading to overflowing dumps and trash flowing into critical habitats and waterways. Architecture students from NYIT through the sLAB initiative and led by their teacher Tobias Holler of Holler Architecture are working on a project that can help the waste management problem for the community of Nosara on the northwestern coast of Costa Rica. The building itself takes inspiration from local passive tropical design strategies and is a long narrow open-air volume to encourage natural ventilation. The center has three zones (a sorting facility, an open lobby, and support spaces) under a common roof and will be made from locally sourced timbers and recycled materials. High ceilings and a reflective roofing materials will minimize heat build up inside. Members of the local community support the project and the city has already donated the land for the building while a local architecture firm, Salagnac Architectos, is aiding the students' efforts. sLAB recently began a Kickstarter campaign to fund the project, help pay for the students travel to Costa Rica and document the project during construction.